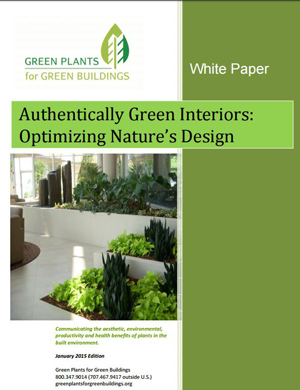 This Whitepaper was produced in accompaniment with Green Plants for Green Buildings’s Registered Trainer Program. GPGB is an approved provider of continuing education in the US and across Canada for AIA, IDCEC, ASID, BOMI, ASLA and USGBC members and Canadian counterparts. If you are interested in booking a continuing education presentation, please visit our Continuing Education page or contact GPGB at 707.467.9417.